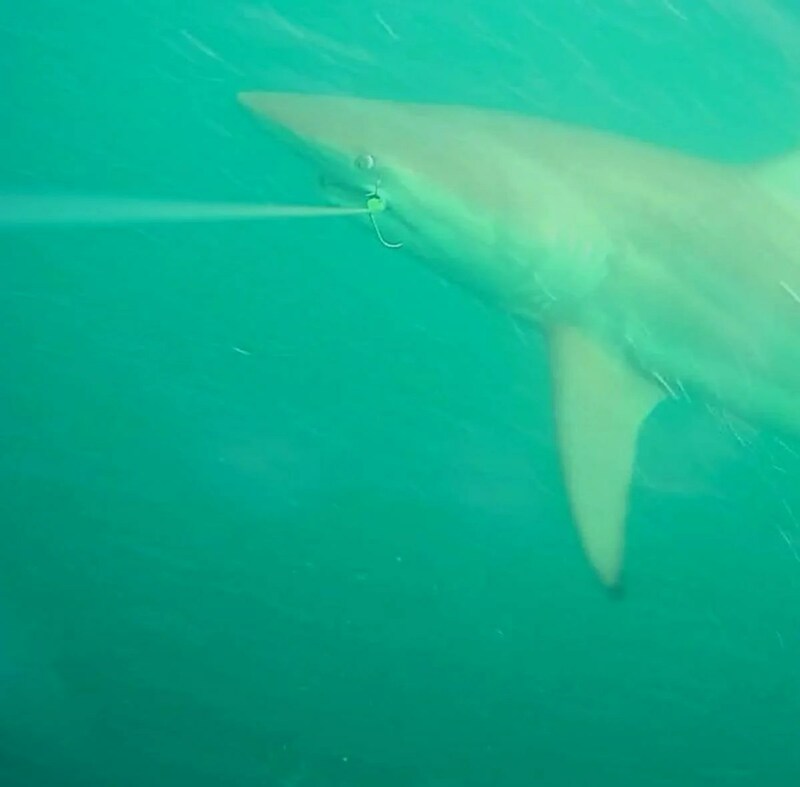 When Dr. Mario Lebrato first reviewed a bunch of underwater recordings shot with GoFish trolling cameras – of fish attack behaviour, that we made out off of the Bazaruto Centre for Scientific Studies recently – some crazy sounds came booming from out of his office. Myself and Callum Roberts (visiting shark scientist and the reason for us targeting Zambezi Sharks as he completes some serious scientific research work at the BCSS) bounded into his office, only to be exposed to the most eye-widening imagery ever seen by either of us. Mainly Zambezis – the particular troublesome species we have been targeting for spatial monitoring and movement tagging. But also King Mackerel – reckless and lethal as they were hunting in packs – they operate together. Amazing to see. Even the big ones. And when your livebait starts to panic like it would after a few minutes in these waters, make no mistake your bait is being stalked and charged from all angles. What was amazing is that they turn away so often. It’s about one in ten charges – that the ‘couta actually hits the bait. The pack seems to goad one of them into eventually taking on strike duty. And they all hang around and share the spoils after the striker gets the bait off the trace! Which happened surprisingly often. Watch this video! The Zambezi’s were the same, as in there was never only one of them. Up to six at a time were recorded happily sitting barely two metres below the propellers, easily keeping pace with us as we dragged a dredge and a bunch of lures around behind us, at quite some speed. Obviously, as we had a strike, it was barely a few seconds and a shark would climb on. The Cobia acted the same. And often swam with the sharks. In amongst them. Huge fish. As did the Talang Queenfish we were lucky enough to film off of Paradise Island. We scored an unlucky flying fish that flew onto the boat. About 5 inches long. The trace we had was too heavy for starters, but a bunch of queenfish came in and inspected, mock charged, turning away every time. A custom trace with light nylon would have gotten that strike. But we did get one on spoon, which may show a relationship between strike rate and live baits in the water. Yellowfin Tuna, at these initial stages of fish behaviour analyses, have been the most wary and sensible. 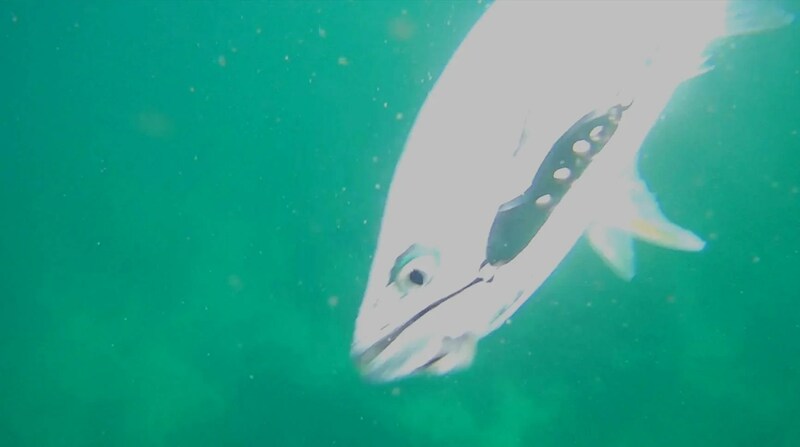 The bonito and skipjack footage that we recorded in our wake following us – unbelievable. Like an over-stocked aquarium, there were fish everywhere, and going in all directions! This particular application of video technology to our favorite past time of fishing has potential to completely shift the way we see and treat the ocean and it’s fish. It was far more of a thrill seeing what had happened as recorded and reviewed through the day than actually catching and fighting the fish. The following video was compiled to study the king mackerel as they come in hot and fast onto the target. You will see that they definitely come in from the flank or rear, and that they go for the tail first. In this clip, one couta actually removes the tail completely with a lightning fast strike. And then another of the three featuring king mackerel comes in and takes the bait right off the trace. But he hooks himself. And then, in a flash, he just shakes the trace free. All we could see from the boat, was a few dips on the rod tip. The fish never even took drag, since they were coming in for the strike in the general direction of the boat ie towards us! And for sure the camera was always deployed on a real stiff big gun. Tackle just too much for them. We lost quite a few cameras in the end. Sharks and other beeeeg fish we will never know about. But basically, without the GoFish camera, we would have experienced none of the thrilling wildlife action going on barely a few metres behind the boat. It really has made an effect on us as we now are using this information to make new sfyle traces. But more about that in another article. GOFISH Cam available online right here!